Gold began modern Humboldt County, but Redwoods made it grow. Over 100 million years ago, redwoods were common in Europe, Asia and North America. Then the climate changed, and the continents drifted apart. Now sequoia sempervirens is restricted to the fog belt along the northern California coast - an area about 500 miles long and 30 miles wide. Exceptional resistance to fire, insects and disease allows these trees to thrive. They can live longer than 2000 years and grow to be over 300 feet. California's influx of gold seekers started a state-wide building boom and demand for lumber. This area also had that valuable natural resource. By 1854, nine lumber mills operated around Humboldt Bay. Soon redwood was being shipped around the world. New tools and techniques had to be developed to handle trees larger than those known to Eastern lumbermen. Axes undercut the side where the tree was to fall, then cross-cut saws and wedges were used to topple the tree. Logs were hauled down skid roads by oxen and dumped into streams to float to mills or waiting ships. By the 1880s, steam-powered "donkey engines" replaced oxen, hauling logs on cables. As lumbering extended further into the woods, trains hauled out logs. Timber companies built their own rail lines, spanning ravines with monumental trestles. 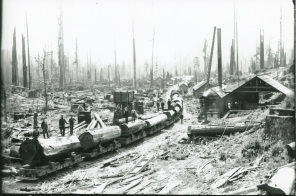 Logs were cut into planks, shingles and stakes at lumber companies' mills and the products were often shipped out by the companies' own fleets. A surge in the industry came after the 1906 San Francisco earthquake and the demand for lumber to rebuild that city. For generations, lumber has been a major employer in Humboldt County. Company owners made fortunes but also contributed much to their communities. Some reforestation encouraged sustained yield. In the 20th century, park creation preserved large tracts of woodland. This reduced the economic potential of timber, but enhanced the role of tourism.